Complete Lawn Renovation in one pass with this attachment for a Bobcat MT52 or Dingo Mini Track Loader. It will till/chop existing turf or rough graded lawn area, bury clumps small rock and bring fine top soil to the surface then level and lightly compact with mesh roller in one pass leaving a perfect surface to apply seed or sod. 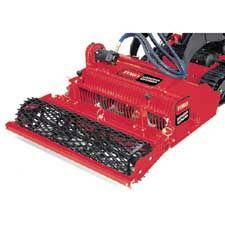 # OF TINES: 20 # OF GRATE FINGERS: 31 OVERALL WIDTH: 53.16" WORKING WIDTH: 36" SHAFT DIAMETER: 1.5" TINE DIAMETER: 15.75" WEIGHT: 430 LBS WORKING DEPTH (MAX): 5.5"
* Please call us for any questions on our bobcat/dingo soil cultivator rentals in Portland OR, Gresham OR, Milwaukee OR, and surrounding metro area.